Parenteral Nutrition (PN) is a life-saving treatment used for patients with Intestinal Failure (IF). PN is complex and demands highly specialised care to avoid serious complications in the home setting. 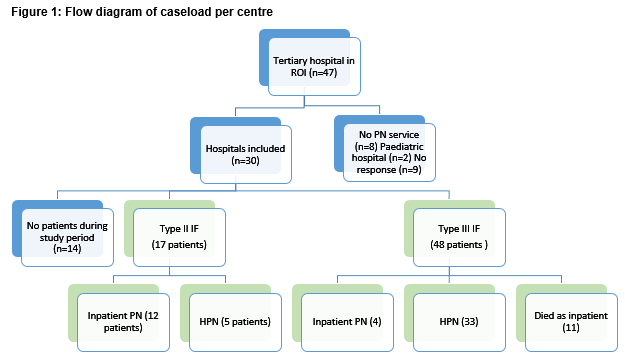 All tertiary centres in the Republic of Ireland (ROI) were contacted to assess the prevalence of IF requiring PN and complications, over a one year period. Sixty-seven patients were treated across 15 centres: a period prevalence of 14.6 and 9.6 patients per million for long-term PN and home PN respectively. Three-quarters of patients experienced at least one major complication with 18% mortality rate over the study period. There were 2.86 admissions per HPN patient, each lasting mean 13.4 days. 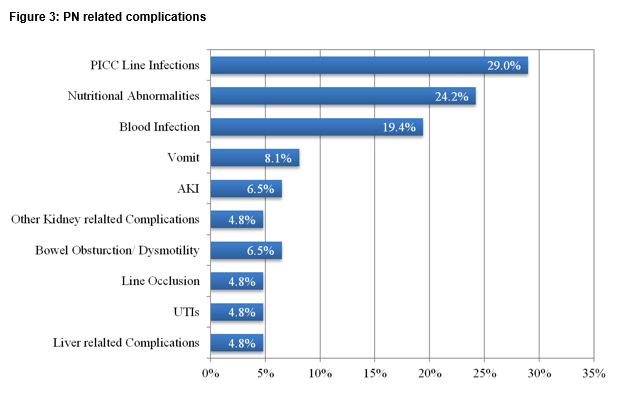 One-third experienced catheter-related infections. There was a reduced length of stay during emergency re-admissions in high volume centres (mean 31 v 43 days, p=0.17). The establishment of a National Centre for IF/HPN in ROI is integral to reducing PN-associated complications. Each year in Ireland, between 80 and 100 patients develop severe acute intestinal failure (IF) with a requirement for highly specialised care1. Intestinal Failure (IF) may be defined as ‘the inability to tolerate 80% of nutritional requirement delivered enterally for a minimum of 48 hours 1,2. IF may be temporary or permanent and occurs for a variety of reasons, including major surgical resection due to malignant or non-malignant disease, obstruction, congenital defects, and abnormal motility. IF can be classified into Types I, II or III according to duration of nutritional support required and reversibility of the original pathology. Type II IF is of >28 days duration and requires more prolonged and greater nutritional support in comparison to Type I. It occurs in metabolically unstable patients, most commonly after bowel resection with complications. Outcomes (based on best practice management within specialist IF units) reported are represented by full intestinal rehabilitation (40%), long term enteral nutrition (10%) or prolonged need for HPN (50%). Type III IF is a chronic, irreversible condition and requires long-term HPN. Patients are metabolically stable but cannot absorb sufficient nutrients and fluids. It arises from gastrointestinal or systemic benign diseases, often requiring multiple intestinal resections (such as Crohn's disease, radiation enteritis), congenital digestive diseases or the end stage of intra-peritoneal cancer. Parenteral Nutrition (PN) refers to the feeding of a person intravenously with a nutritional formula, specifically formulated for that person3. PN is necessary in patients with chronic Type II or III IF patients in order to sustain life, as the bowel is unable to adequately absorb the nutrients needed for normal body composition and function. Depending on the disease indicating the need of PN, the duration of treatment can vary in length. Weaning from HPN after 1–2 years may be achieved in 20%–50% of patients, subject to best practice care4. Patients with type III IF due to benign disease should have a high probability of long-term survival on HPN (about 80% in adults and 90% in children over 5 years in specialist units5). Over years of treatment, patients with CIF accrue a 10-15% chance of dying from therapy related complications internationally6. Many of these complications are preventable. For example, catheters used to deliver PN are associated with potentially life threatening episodes of sepsis. The average adult HPN patient has one episode every 2-3 years but the incidence declines significantly over time –indicating the importance of patient and carer training5. Furthermore, quality of life studies indicate that the provision of HPN improves quality of life of patients7. This relatively small group of patients with highly complex needs challenge even the most experienced clinicians. The aim of this study was to measure the point prevalence of Type II/III intestinal failure in Ireland and assess some quality of care indicators regarding their care. Each of the 47 tertiary care centres providing adult care in the Republic of Ireland were contacted to determine the numbers of patients with Type III intestinal failure receiving parenteral nutrition. Type II IF was defined as per ASGBI position statement guidelines1 and patients who received at least 28 days of parenteral nutrition and type III as those whose requirement for PN would likely be >28 days. In general, the point of contact was a senior dietician within the hospital, who provided anonymised data for patients within their hospital via online secured web-based questionnaire. The study period was from April 1st 2015 to March 31st 2016 and data were collected in April 2016. Outcomes were assessed according to volume of patients treated during the study period – arbitrarily defined as high (≥5 cases) and low (<5 cases) volume. Compliance with ESPEN guidelines for long-term monitoring of HPN in adults were assessed (biochemistry and anthropometry at every visit, trace elements and vitamins measured every 6 months and bone mineral density measured yearly)8. This study was approved by the Institutional Review Board (University of Dublin) and data were managed in accordance with Good Clinical Practice guidelines. Continuous data were assessed using student’s t-test and categorical data with Χ2 test. All statistical analyses were two-tailed with the threshold of significance set at P < 0.05. Of 47 tertiary care facilities in the Republic of Ireland, two were paediatric hospitals and 8 do not provide any parenteral nutrition services. Nine centres did not respond to requests for data (Figure 1), including four university-affiliated teaching hospitals (Model 4 hospitals) which were likely to have a greater number of patients than the 5 other model three hospitals who were not included. Of the 30 centres who responded, 15 centres had no cases meeting inclusion criteria during the study period. 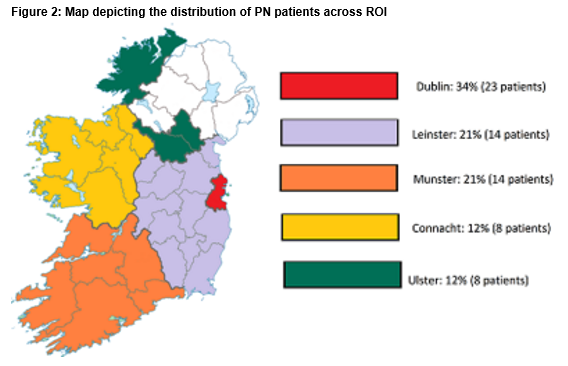 In the other 15 centres, there were 67 patients on long-term PN with 44 of those patients on HPN in the ROI from the period of April 1st 2015 to March 31st 2016. This represents a period prevalence of 14.6 and 9.6 patients per million inhabitants respectively. Of these patients 17 were type II IF and the remainder were type III IF. 66% of patients on long-term PN were being treated at home. Two-thirds of the patients were female, with a median age of 56 (17-83). One fifth of the patients included required PN for malignant bowel obstruction. There were a variety of other indications for PN including short bowel syndrome (38%), Intestinal dysmotility (16%), Intestinal fistula (8%), Radiation enteritis (8%), Crohn’s disease (7%) and other (three percent). Patients were distributed across the country in accordance with the distribution of the total population (Figure 2). Patients in Ulster were furthest from their care centres (94km) while patients in Dublin were closest (14km). On average, patients were 49km from their care centres. Eight of the 56 were travelling were over 100km. Eight patients were current inpatients. 62 patients were living at home and 2 were in nursing homes. The majority of patients are treated in Dublin hospitals (60%), with 15 different centres nationally involved in providing treatment for type III IF patients. The median number of patients treated in each centre was 2.5 (range: 1-17). Ten centres treated only one or two cases during the study period. There were 5 high volume centres (defined as ≥5 cases per centre) – the largest treating 17 patients during the study period. Ninety-seven percent of the patients underwent regular blood testing, with most of them getting checked every one to two weeks. Seventy percent had their weight checked at every appointment. 58% of patients had micronutrients levels checked. Half of the patients underwent LFTs and 23.4% had U&E taken. Twenty-two percent of patients have bone profile checks every year, and two female patients also had DEXA scans due to osteoporosis. Only 20% of patients received recommended long-term monitoring as per ESPEN guidelines2. Most of the patients saw medical professionals every two weeks (76%), and every patient had at least two appointments per annum. The lead medical professional was a surgeon in 92% of cases. All patients had a dietitian as part of their multi-disciplinary team. Only one hospital (which contributed 18% of patients recorded) had a nutritional nurse available. The mortality rate of patients treated during the study period was 18% (12/67). 54% of patients surveyed had emergency treatment directly relating to their PN in the last 12 months and 77.4% of patients experienced at least one major complication in the last year. One third experienced a central line infection, with positive blood cultures in two-thirds of these cases. Five percent of patients had line occlusion. One quarter experienced nutrition or electrolyte abnormalities requiring re-admission with acute kidney injury in 11% and liver related complications in 5% (Figure 3). There were on average 2.86 admissions per HPN patient over the course of the study period, each on average lasting 13.4 days, or 38 hospitals days per patient per year. When assessed according to the volume of cases treated, patients treated in high volume centres had a shorter length of stay for emergency admission (43 versus 31 days, p=0.17). There were also trends towards a reduction in the likelihood of requiring emergency readmission (69% versus 49%, p=0.25) and proportion of patients receiving HPN (versus inpatient PN: 61% versus 22%, p=0.27) in high volume centres. This study intends to measure the prevalence of Type III intestinal failure within the Republic of Ireland and to assess service provision for this small group of patients with highly complex needs spread across a large number of non-specialist hospitals. Existing data concerning the prevalence of intestinal failure within Ireland are limited9,10. Based on international data, the prevalence of patients with type III IF (irreversible failure, generally requiring long term PN) is approximately 15-20 patients per million and the incidence of new cases 2-6 per million per year2. This is equivalent to between 80 and 100 adult patients requiring care within a specialist IF unit per year and between 10 and 30 new HPN adult cases each year in ROI. This study recorded 44 prevalent cases equivalent to a point prevalence of 9 per million population, with a significant proportion of patients receiving HPN for IF related to metastatic cancer. These data indicate that there may be sub-optimal recognition of intestinal failure requiring PN or an inability to convert critically ill patients with type II IF to type III IF, maintained on HPN. Additionally, one-third of current Type III patients are receiving PN as inpatients in acute tertiary centres which may reflect sub-optimal establishment of PN and under-utilisation of HPN. It is widely accepted that PN treatment is significantly cheaper when delivered at home (with costs reduced by 50-60%)7. There is fragmentation of care as indicated by the large number of centres with one or two current Type III IF patients – 10 of 15 centres in this study. In only one centre was a specialist nutrition nurse available– a resource associated with a reduction in complications as well as cost savings11. International consensus guidelines recommend routine investigations to mitigate the long-term effects of PN – these investigations are received by fewer than 20% of Irish patients8. The absence of a centralized support services increases the complexity of management in these centres. Data from this study also show a current excess burden of complications with three-quarters of patients experiencing at least one major complication and an 18% mortality rate over the study period. There were on average 2.86 admissions per HPN patient over the course of a year, each on average lasting 13.4 days, or 38 hospitals days per patient per year. Even at the national average bed day costs of €889, this suggests a cost to the health service for each of these patients of at least €34,000 in emergency admissions per year, far in excess of the complication rates reported by specialist centres12-14. Given that catheter-related sepsis is the most prevalent complication and largely preventable, these data indicate a clear role for standardisation and greater support of this vulnerable population. The internationally acceptable catheter related infection rate is 1-3 infections/1000 catheter days, whereas in this study, 1/3 of IF patients experience catheter related infection in the past year15. Preliminary analysis of differences in care between high and low and volume centres in Ireland show a reduction in length of stay (LOS) during emergency re-admissions in HPN patients in high volume centres (mean 31 v 43 days, p=0.17). There were also trends towards a reduction in the likelihood of requiring emergency readmission (69% versus 49%, p=0.25) and proportion of patients receiving HPN (versus inpatient PN: 61% versus 22%, p=0.27) in high volume centres. Currently within the Irish healthcare system, there is no specialist service available for IF or HPN patients. The absence of a dedicated National IF Unit for adults represents a significant risk for patients and is contrary to best international practice and consensus guidelines2,8,10 which highlight the need for national healthcare systems to establish dedicated IF units that meet specified minimum criteria for service configuration, staffing governance and audit. In contrast to ROI, Northern Ireland operates a 12 bed intestinal failure specialist tertiary unit for a population of just over 1.6 million. Specialist units have expertise in patient selection, operative risk assessment, and multi-disciplinary support such as nutritional input and interventional radiology. Treatment in a specialist unit has been shown to dramatically improve the morbidity and mortality of this complex condition12,13. Evidence also shows that these units can beneficially affect the continuing dependence on parenteral nutritional support, with potential cost savings16. Correspondence: Professor John V. Reynolds, Department of Surgery, Trinity Centre and Institute of Molecular Medicine, St. James’s Hospital, Dublin 8. All authors fulfilled authorial roles as per ICJME guidelines. The underlined authors contributed equally to the production of this manuscript and should be regarded as first authors. Acknowledgements: The authors wish to thank the following Registered dieticians for their time in providing information for this report: Naomi Bates, Cathy Begley, Sheila Bowers, Caitriona Caulfield, Grainne Corrigan, Fiona Cregan, Michelle Fanning, Sinead Feehan, Arún Fenton, Fiona Finneran, Rebekah Forbes, Alicia Gordon, Grace Hallinan, Keira Higgins, Aine Higgins, Michelle Hodnett, Michelle Hurley, Cathy Keegan, Linda Kelleher, Aisling McHugh, Elaine Neary, Carmel O'Hanlon, Maeve O'Shaughnessy, Gillian Quinlan, Carmel Quinn, Sarah-Jane Rodgers, Jean Savage, Nina Singaroyan, Joanne Walsh, Karen Whiriskey. 1. Association of Surgeons of Great Britain and Ireland. The surgical management of patients with Acute intestinal failure. 2010. 2. Pironi L, Arends J, Baxter J, Bozzetti F, Peláez RB, Cuerda C, Forbes A, Gabe S, Gillanders L, Holst M, Jeppesen PB, Joly F, Kelly D, Klek S, Irtun Ø, Olde Damink SW, Panisic M, Rasmussen HH, Staun M, Szczepanek K, Van Gossum A, Wanten G, Schneider SM, Shaffer J. ESPEN endorsed recommendations. Definition and classification of intestinal failure in adults. clinical Nutrition. 2015;34(2):171-80. 3. Jeejeebhoy KN. The etiology and mechanisms of intestinal failure. Intestinal failure and rehabilitation: a clinical guide: CRC Press, New York; 2005. p. 25-37. 4. Carbonnel F, Cosnes J, Chevret S, Beaugerie L, Ngô Y, Malafosse M, Parc R, Le Quintrec Y, Gendre JP. The role of anatomic factors in nutritional autonomy after extensive small bowel resection. Journal of Parenteral and Enteral Nutrition. 1996;20(4):275-80. 5. Howard L, Ashley C. Management of complications in patients receiving home parenteral nutrition. Gastroenterology. 2003;124(6):1651-61. 6. Messing B, Lémann M, Landais P, Gouttebel M-C, Gérard-Boncompain M, Saudin F, Vangossum A, Beau P, Guédon C, Barnoud D. Prognosis of patients with nonmalignant chronic intestinal failure receiving long-term home parenteral nutrition. Gastroenterology. 1995;108(4):1005-10. 7. Richards D, Irving M. Cost–utility analysis of home parenteral nutrition. British Journal of Surgery. 1996;83(9):1226-9. 8. Staun M, Pironi L, Bozzetti F, Baxter J, Forbes A, Joly F, Jeppesen P, Moreno J, Hébuterne X, Pertkiewicz M, Mühlebach S, Shenkin A, Van Gossum A. ESPEN Guidelines on Parenteral Nutrition: home parenteral nutrition (HPN) in adult patients. Clinical nutrition. 2009;28(4):467-79. 9. Geoghegan A, Donohoe C, Reynolds J. Acute intestinal failure in surgical patients: an audit of incidence, management and outcomes in an irish hospital, and compliance with ASGBI guidelines. Irish journal of medical science. 2012;181(4):467-71. 10. RICE N, DOWSETT, J., HANLON, C. O. A Review of Home Parenteral Nutrition in Ireland: Recommendations for Action. Dublin: 2013. 11. Kennedy JF, Nightingale JM. Cost savings of an adult hospital nutrition support team. Nutrition. 2005;21(11):1127-33. 12. Furtado S, Ahmed N, Forget S, Sant'Anna A. Outcomes of patients with intestinal failure after the development and implementation of a multidisciplinary team. Canadian journal of gastroenterology & hepatology. 2015. 13. Modi BP, Langer M, Ching YA, Valim C, Waterford SD, Iglesias J, Duor D, Lo C, Jaksic T, Duggan C. Improved survival in a multidisciplinary short bowel syndrome program. Journal of pediatric surgery. 2008;43(1):20-4. 14. Howard L. Home parenteral nutrition: survival, cost, and quality of life. Gastroenterology. 2006;130(2):S52-S9. 15. Zhao VM, Griffith DP, Blumberg HM, Dave NJ, Battey CH, McNally TA, Easley KA, Galloway JR, Ziegler TR. Characterization of post-hospital infections in adults requiring home parenteral nutrition. Nutrition. 2013;29(1):52-9. 16. Fishbein TM, Schiano T, LeLeiko N, Facciuto M, Ben-Haim M, Emre S, Sheiner PA, Schwartz ME, Miller CM. An integrated approach to intestinal failure: results of a new program with total parenteral nutrition, bowel rehabilitation, and transplantation. Journal of gastrointestinal surgery. 2002;6(4):554-62.